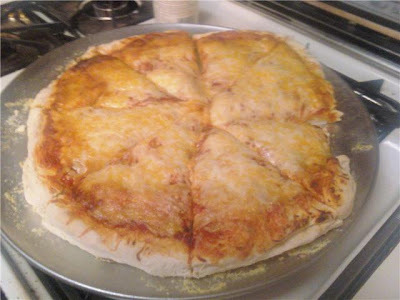 everydaymatters: I made pizza, and it was FANTASTIC. This story starts with Christmas, when I got my wonderful KitchenAid mixer. I was reading the instruction book that came with it, and inside was a recipe for pizza dough. Fast forward to about the time Papa died, and Josh and I were online ordering pizza. By the way, do you know you can order pizza ONLINE!? The world these days, I'm telling you. So we were on the Pizza Hut and the Papa John's website picking what we wanted and comparing prices for both. We wanted one pizza and it was coming up to almost $20, and then delivery fees and taxes ON TOP of that. It was crazy. We were discussing it and I said "I really should learn how to make pizza". We eat pizza a lot, it's just so easy. On Saturday we were sitting on the couch and I was thinking it sounded good, so I decided I was going to make it. I figured I'd just make one for us for dinner. Then Joshua's mom came over and we were all sitting at our dining room table discussing what we were going to do for his birthday. Lisa likes to take him out to dinner and was suggesting we go to Cork 'n Cleaver (an outrageously priced steak restaurant. I know it's good, but a steak is a steak, if you ask me.) Josh doesn't really like going out with a big group of people for dinner (I don't either, it always takes so long and seems like such a hassle), so I suggested we stay home and I'd cook. I've cooked for my parents and Lisa before, so I figured it wouldn't be a big deal. After I offered I started thinking about it and realized that this would be cooking for seven people...so I didn't invite my parents. Haha. Then I started to worry. 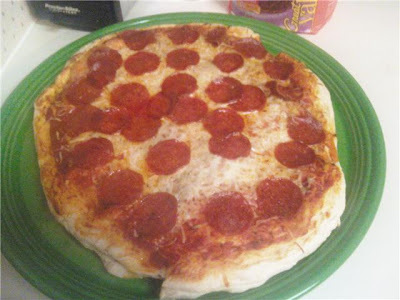 I'd never made pizza before and I was going to try out this new recipe on Josh's birthday dinner, and feed it to his whole family. I had no back up if I messed it up. It was pretty risky. So I started by making his cake. He likes homemade cakes. Funfetti is his favorite, but not too long ago he said he wanted a Cherry Chip cake. He decided he'd rather have that for his birthday, so that's what I made. I baked it, and set it out to cool. While that was happening I went to the store to get the pizza ingredients. Normally, I'd share the recipe. I'm not going to with this one - and it's not because I'm selfish. The reason is, I don't know how to make dough without my mixer - and it is different than making it by hand. The only directions I have to give are the mixer ones, which really are impossible to use if you don't have them. I feel bad, really. If you have a mixer, let me know and I'll get you the recipe right away. The dough is really the only recipe that matters though. 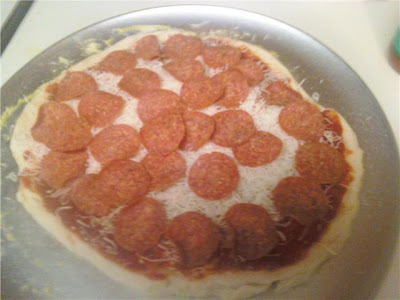 Once that's made and spread out, you put on pizza sauce and all the toppings you want. It was super easy once I got the hang of it, and they were so good. Josh's family really liked them, at least I think so, because there wasn't much left! Josh liked them, and that's really all that matters :). Here are some pictures of my prized pies. 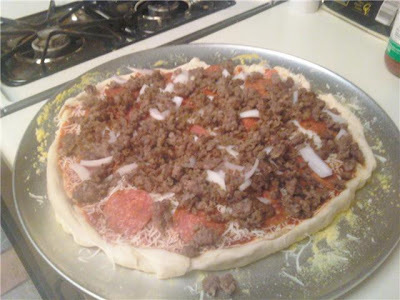 This is pepperoni, sausage, and onion, before the oven. 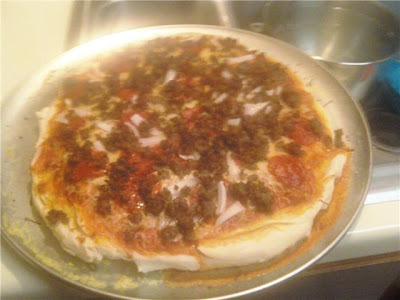 Finished pepperoni, sausage, and onion. I'm telling you, these were great. I'm definitely going to have friends over and make more.